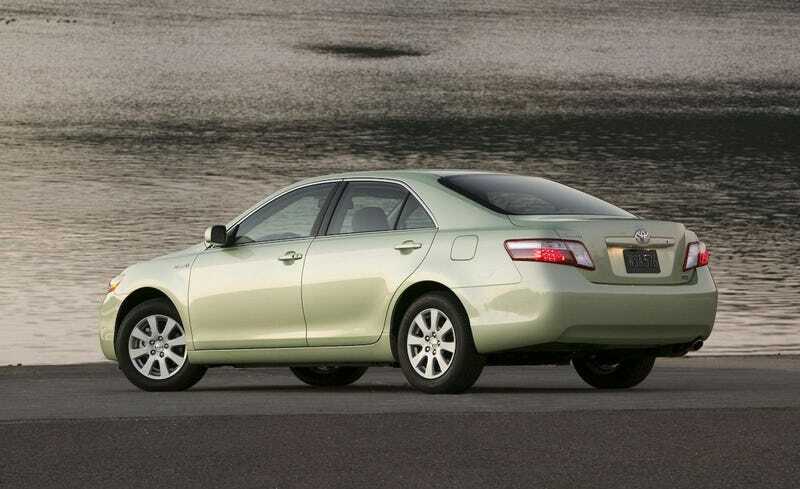 The National Highway Traffic Safety Administration has opened a probe into intermittent brake failure in the 2007 and 2008 Toyota Camry hybrid sedan. Dozens of consumers have complained to the agency about the problem, asking it to force Toyota Motor Corp. recall the cars. Toyota has previously paid record federal fines for not recalling vehicles promptly. The agency said Monday that it would look into reports of delayed braking and brake failure from owners of the vehicle. The problem could affect up to 30,000 cars. NHTSA said it has had 59 complaints, including two reported accidents. "When I tried to apply brakes to stop, I realized that the brake had completely failed" one driver said in a complaint to NHTSA. "I did a sharp evasive turn and hit the curb hard in [an] attempt not to run over pedestrians in the crossing!" One Camry owner was charged more than $2,600 by a dealer to replace an actuator in the braking system. The charge was covered by an extended warranty, but the driver complained to NHTSA that it should investigate and require a recall given the number of similar complaints. In most of the complaints, drivers said they pressed the brake pedal and experienced either a delay in response or had to put more pressure on the pedal to get the car to slow. Some reported brake failures. Many of those complaining said Toyota was aware of the problem and should voluntarily recall the vehicles and pay for repairs. One owner was quoted a price of $3,000 to repair the brake system. "I am also aware that this issue is more common, especially on Toyota Camry hybrids around 5 years old," the owner wrote to NHTSA. "It is ridiculous to have to pay 10% of my car's original price since it is a widespread safety problem." Safety regulators said that about 40% of the braking incidents were occurring at speeds of 40 miles per hour. NHTSA also said that the pace of people filing complaints has increased, with 55% being filed within the last eight months. Toyota is cooperating with federal investigators, said John Hanson, a spokesman for the Japanese automaker. "We will work with NHTSA to find out if there is a consistency here," Hanson said. "This isn't something that we know for sure yet what the problem is or what the fix will be. That is what this portion of the process is about." In late 2012, NHTSA fined Toyota Motor Corp. $17.35 million for not promptly recalling Lexus RX 350s and RX 450h sport utility vehicles because a floor mat on the driver's side could jam the gas pedal, causing the car to accelerate when the driver didn't intend to. Four years ago Toyota paid a record $48.8 million in fines as a result of three separate investigations into the automaker's handling of recalls for similar pedal entrapment problems in other vehicles, sticky gas pedals and steering relay rod problems. Federal law requires all auto manufacturers to notify NHTSA within five business days of determining that a safety defect exists or that the vehicle is not in compliance with federal motor vehicle safety standards and to promptly conduct a recall.